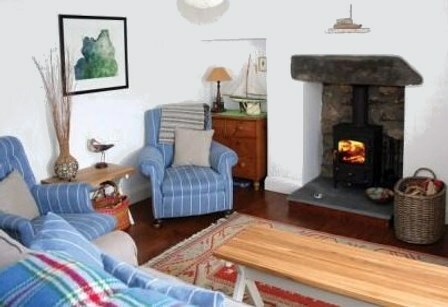 The living room has a relaxing cast iron wood burning stove and a squashy sofa and armchairs from which to enjoy the sea view from the picture window. There is also a flat screen TV, DVD and Hi-Fi with a good supply of films and DVD’s. 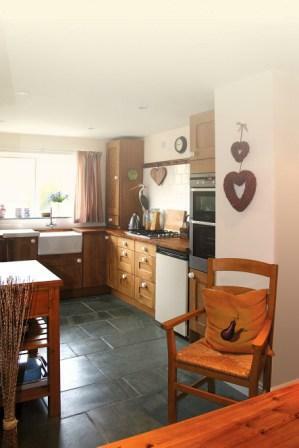 The well equipped dining kitchen also has its own wood burning stove and there is a modern double oven, gas hob, dishwasher and microwave. There is also a small but perfectly formed utility room with washer and dryer. The ground floor also has a small bathroom with a shower – great for hosing down sandy children (and adults) coming in off the beach! Needless to say we have a full selection of buckets, spades and also fishing nets for the rock pools for you to use.